Prairie Pines Assisted Living in Eads is expecting to ask Kiowa County voters to continue a 3.82 mill levy, which will be used to continue paying down construction debt and defray some operating expenses. The request is slated to be on the ballot in November. Pam Weirich, who directs the day-to-day operations at the facility, was careful to note that the ballot question will not represent a tax increase. Instead, it continues a levy that has been in place which pays the construction debt and covers a portion of operating expenses. The mill levy represents about 19 percent of the annual operating budget, including debt service. "Once the construction debt is paid, our goals is to drop the mill levy and operate on our revenue," said Weirich. Prairie Pines provides 24-hour assisted living care for up to 24 residents with a current staff of 16, and serves as a bridge between home-based care and longer-term, more extensive care needs provided by nursing homes. Weirich said informational meetings about the mill levy extension are being planned for locations across Kiowa County over the coming months. Board members will also be staffing a booth at the Kiowa County fairgrounds this week during the annual county fair and rodeo to answer questions county residents have about the ballot measure. The facility is also hosting an open house September 7 from 11:00 a.m. to noon, and again September 8 beginning immediately after the annual fair parade. Community members - and anyone interested in visiting the facility - are welcome at any time. Weirich stated she would be happy to answer questions or address concerns. "Transparency is key," Weirich noted. "We are careful with every penny, and do not spend what we don't have to." The facility's finances are heavily influenced by changes in resident numbers. While there are currently 16 residents at Prairie Pines, the population was as high as 19 in recent months. Further impacting the operation are the number of residents dependent upon Medicaid payments. Medicaid determines the amount of payments to Prairie Pines and other facilities without regard to actual operating costs. In addition to the paid staff, Prairie Pines has benefitted from numerous volunteers who help maintain the grounds around the facility, helping to reduce costs. The facility has also received grant funding to replace heating units in 12 of the apartments and complete the serenity garden. Other grant opportunities are also being explored. Board members have also been creative in raising funds for the facility, including holding a raffle, now in its second year. As a 501(c)(3) non-profit organization, Prairie Pines can also accept donations, as well as bequests from estates, which may be tax-deductible. 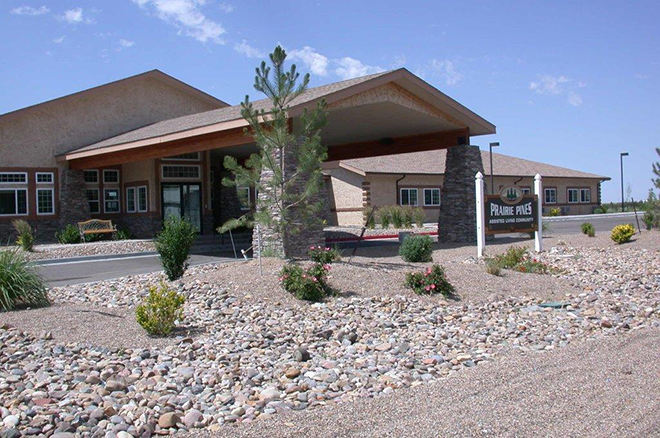 Prairie Pines opened in 2006 following a multi-year construction effort headed by Kiowa County government in response to long-standing demand by residents for assisted living services in the community. The facility has won praise for the caring staff whom Weirich calls team members. "I am proud of them. They truly love our residents," Weirich stated.